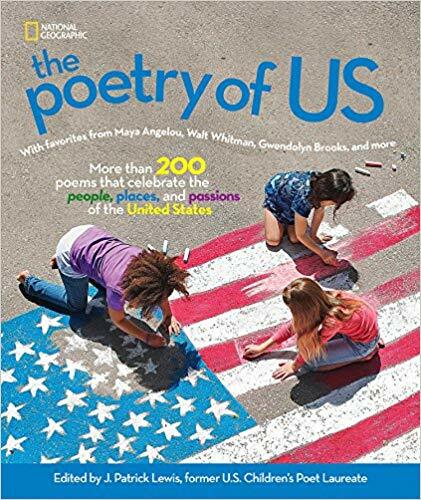 The Poetry of US ~ Grateful for Poetry Anthologies and Anthologists! 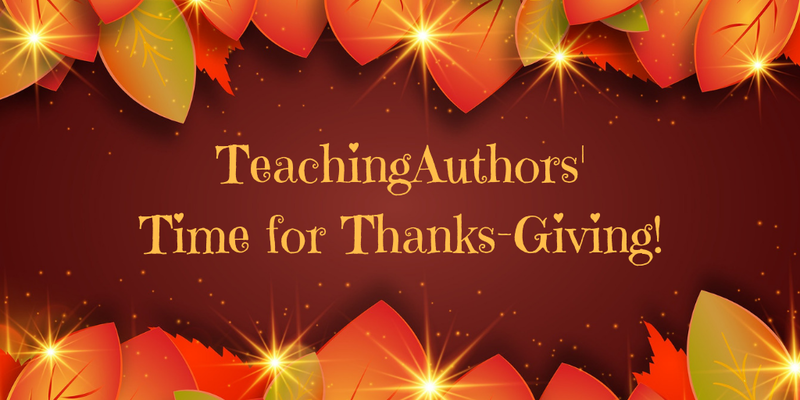 This month, TeachingAuthors posts have been about the things we're most grateful for in the world of words. 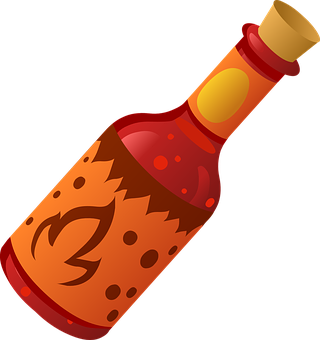 (Except for Wednesday's post, which includes a hot picture book writing prompt called "Dialogue is Sriracha Sauce.") 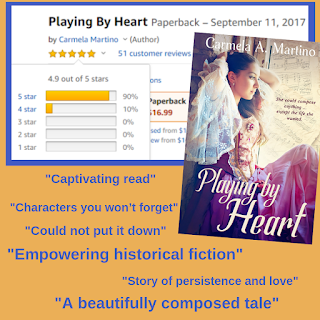 Bobbi is grateful that each of us has a voice, Mary Ann is grateful to her family of storytellers, Carla gives thanks for primary source documents which bring her research to life, and Carmela gives thanks to readers who make a huge difference in the life of a book. Today I am grateful for poetry anthologies and the anthologists who create them. These works are a gift both to the poets in each collection and to their readers. I've been honored to work with many of our finest anthologists. 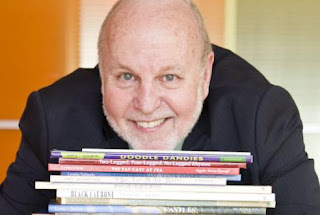 Today I'd like to bow deeply to a "well-loved, deeply-respected, and internationally-renown author and poetry anthologist," (and, may I add, a really fun guy), Paul B. Janeczko who just this month won NCTE's Award for Excellence in Poetry for Children. 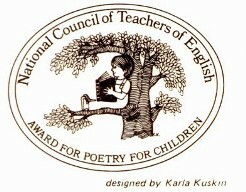 This award, established in 1977, honors a living American poet for their aggregate work for children ages 3–13. 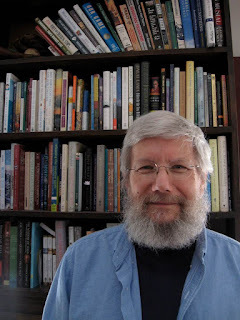 Take a deep dive into his website and see what a remarkable writer and person Paul is. Thank you for all you have given us, Paul--you are deeply loved and you soooo deserve this award! It's both exhilarating and terrifying to write for an editor. Many of my attempts are stiff, lifeless. Nonetheless, I sent Pat nine poems. One was about two pandas getting married (we saw part of a wedding at the zoo), one was from the POV of a child lost in the zoo (I was six years old), two were about an elephant getting a manicure (we saw this on the tour--it's an actual thing! 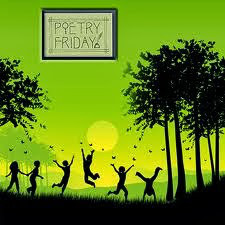 ), a poem titled GOD DISCOVERS THE SAN DIEGO ZOO (about the S.D. Zoo Corps program for teens), one about a surprise date at the zoo (art reflecting life), a take-off of Robert Frost's The Pasture set in the zoo ("you come, too"), a quick and quirky poem about the first female zoo director, and a more serious poem about the same director. Pat picked the last poem. 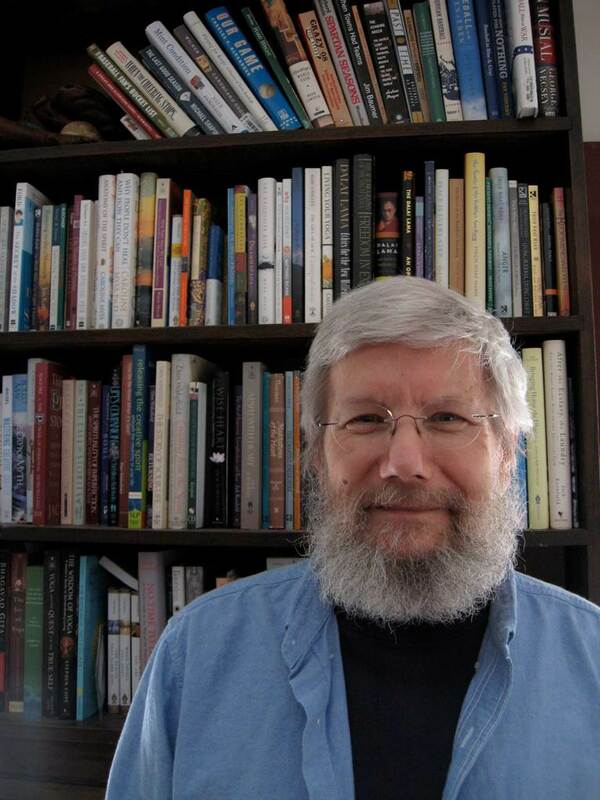 Anthologists are editors, parent figures, therapists, task masters, mentors and more. Pat is one of the most patient editors I've worked with, watering and weeding poems I didn't even know were growing inside me...and then showing me how to clean up their meter and meaning. I was the bookkeeper, that's all. how did I know? It's hard to tell. depends upon your point of view. that drove three zoo leaders away. "You try and run it—go ahead." poem (c) 2018 April Halprin Wayland. All rights reserved. Thank you for hosting PF at Carol's Corner today, Carol! posted with gratitude by April Halprin Wayland with help from Eli, Monkey and Snot. 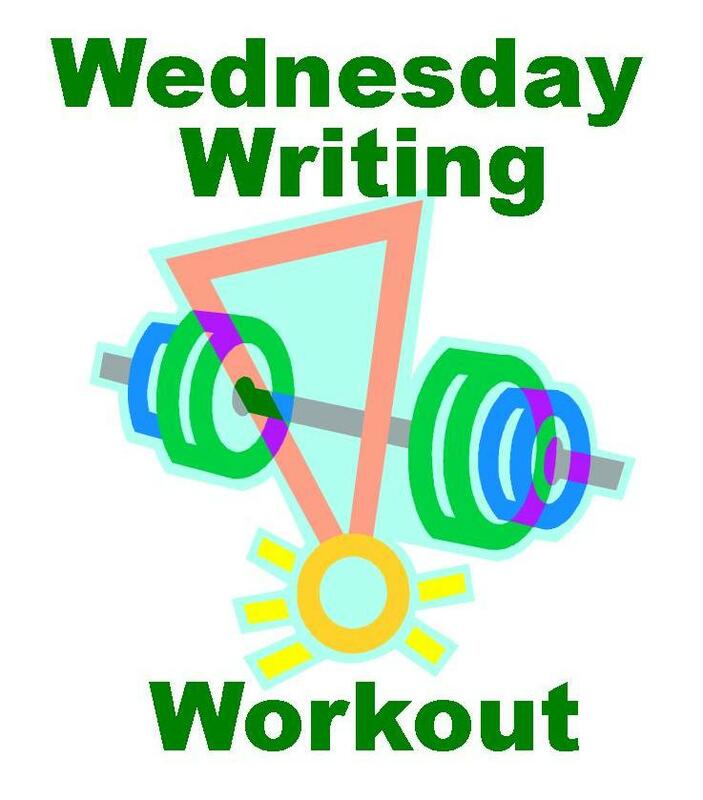 Howdy, Campers, and welcome to another of our occasional Wednesday Writing Workouts! 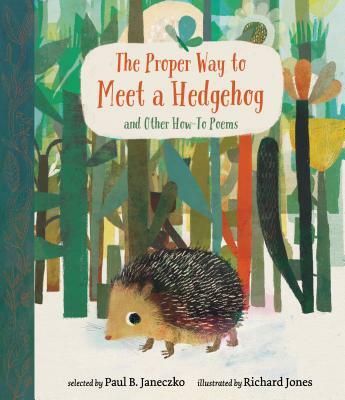 In last Monday's class, we talked about the use of dialogue in picture books and how much fun it is to read these books aloud. I learned early on that including dialogue is like pouring Sriracha sauce on oatmeal. My first book, To Rabbittown, written in free verse, contains no dialogue. But my second (The Night Horse), third (It's Not My Turn to Look for Grandma! ), fourth, (Girl Coming in for a Landing ~ a novel in poems), and fifth books (New Year at the Pier) do. I needed a writing exercise to reinforce my lecture. Creating it was like putting together a two-piece puzzle. 1) I heard an excellent presentation at SCBWI's conference in L.A. this August by the always wonderful Candace Fleming about how she wrote the multi-award winning book, The Giant Squid. One of the things that struck me was that she chooses a word or phrase as her guiding light before she begins researching or writing any book. She calls it the Vital Idea. This isn't a new concept, but the way she presented it helped me understand how crucial this is. The Vital Idea she chose for The Giant Squid was Mystery. Every page, every verb reflects this idea. 2) My friend Ellen recently took an improv class. She reminded me that every idea in improv is answered with "Yes, and..." (For example, if someone is pantomiming and says, "I'm carrying my mother's alligator." the response must be, "Yes, and..." It's never "No, but..."). 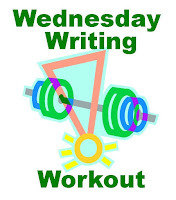 1) come up with a Vital Idea (the guiding principle of the story). 2) write a story completely in dialogue. A further suggestion, which you can take or leave, is to have one character always start by saying "Yes, and" or "No, but." A: Never go to Z Street: there are tigers. B: Yes, there are tigers and lobsters with ginormous claws on Z Street. A: Lobsters with ginormous claws? B: Yes and poisonous carrots! B: Yes and they kill you after six bites! A: Couldn't you just not eat the poisonous carrots? 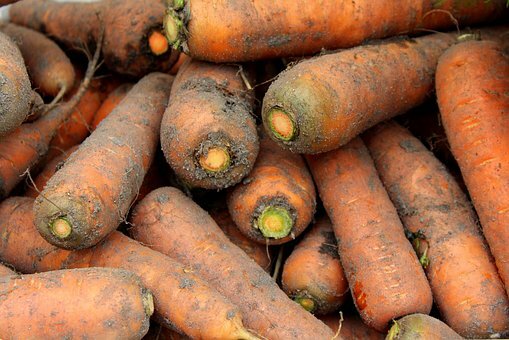 B: No—poisonous carrots sing to you and you can't help but sit down and lean against them and then they encircle you and all is lost. A: All is lost because they make you eat them? A: They want you to eat them? A: Okay. Never go to Z Street: there are tigers and lobsters and poisonous carrots. B: Yes and also there is a little kid with dangerous and sticky fingers who takes your hand and is forever glued to you. B: Yes, except when you're eating a poisonous carrot. A: forever glued to mine. Try this exercise, and if you have any suggestions on how to make it better, please let me know! We at TeachingAuthors have been writing about giving thanks, especially as it relates to writing. Actually, I’m thankful for writing itself through the ages. As the author of nonfiction books, I base all of my research on primary source documents. I’m grateful that for hundreds of years, people have recorded details of their lives. 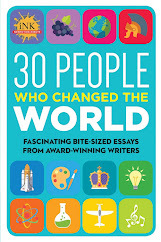 Wealthy and poor people, famous and non famous people, generals and soldiers, mothers and fathers wrote books, letters and diaries that are gold mines of information. Not only have people written about their lives through the years, they and their families kept their letters and diaries. When you write about history today, the details eyewitnesses record can make a nonfiction book come to life. 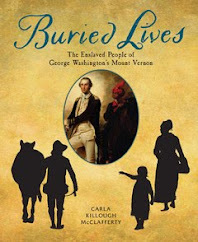 To show you how details from life hundreds of years ago gives life to a book, let me give you an example from my new book Buried Lives: The Enslaved People of George Washington’s Mount Vernon. My newest book-released December 18, 2018. NEXT MONTH THIS WILL BE OUR TA BOOK GIVEAWAY. George and Martha Washington raised her grandson, George Washington Parke Custis-who later wrote a book about his recollections of his life with Washington. This detail about Hercules was priceless to me. I was able to write about Hercules as a gifted chef at the top of his game. With details like these and others, I hope a reader hears the clang of pots and feel the heat of the fire in the hearth as Hercules cooks. My book is filled with details from eyewitnesses who wrote about events and I could not have known them any other way. Using primary sources, I could write about Hercules and put a reader in the room with him more than 200 years later. In this scene in Buried Lives, I want contemporary readers to catch a glimpse into the life of Hercules, an enslaved man-who happened to be owned by the President of the United States. The written word is powerful. If used effectively, the details of kitchen long ago can be a meaningful as the sweetest verse of poetry. 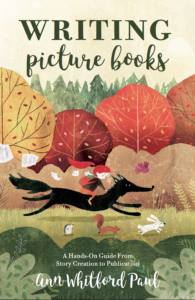 WRITING PICTURE BOOKS BY ANN PAUL. CONGRATULATIONS! KAITLYN S. AND REBECCA A.
November is the Month of Giving Thanks. Everybody else saves it for Turkey-and-Football-Thursday, but we Teaching Authors take the whole month to be thankful. Cutting to the chase, I am thankful for my family. Not just my husband and daughter and extremely needy dog. I am thankful for my extended family...not only both sides of my family, but both sides of my husband's as well. 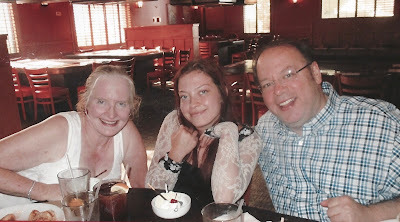 Me, my daughter and husband. Benihana wouldn't let us bring the dog. Whether it's luck or karma or whatever, my entire family are terrific storytellers. Not that any of them thought that of themselves. They didn't think there was anything particularly fascinating about their lives. I beg to differ. It began with Mom. I loved stories. Not just the ones in books, but the ones Mom told about her childhood. 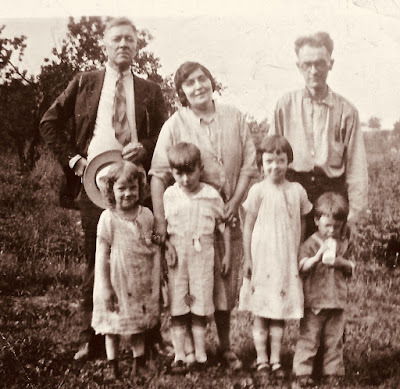 To an only child like me, living on a farm with seven siblings who lived to prank the neighbors sounded exotic. Mom, who was so self conscious about writing, she wrote rough drafts of letters to her family, was a hilariously uninhibited storyteller. 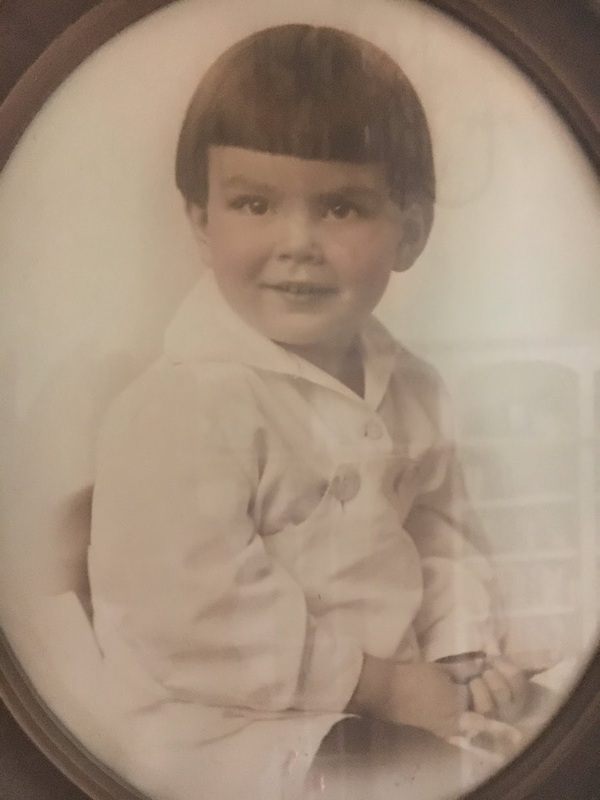 The first stories I ever wrote were based on Mom's childhood. She hooked me on writing and family stories. is behind Jim, the other adults are the parents of the boy in front. 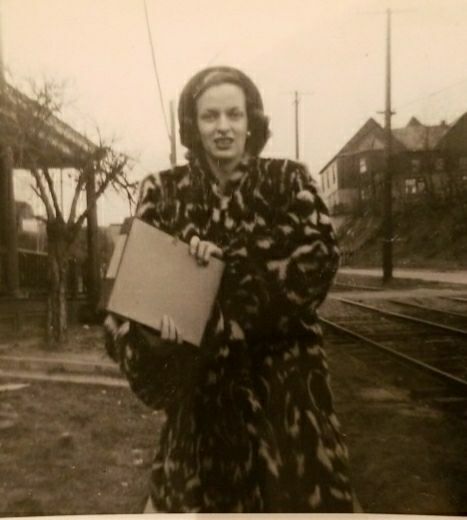 Mom's youngest sibling was my favorite aunt, who had a unique perspective on the family. Born when my grandmother was 45, (unimaginable in the 1920's), she was the only child at home during WWII. My mother and her brothers were in the service, one sister married, the other two working and rarely home. The stories she told me were ones my mother never knew. Her sweet, gentle remembrances of the Pittsburgh homefront formed the core of Jimmy's Stars. From Mom's family, I learned the concepts of point of view and unreliable narrator. My aunts and uncles could tell me a story I had heard from Mom, but each had a totally different take it on it. 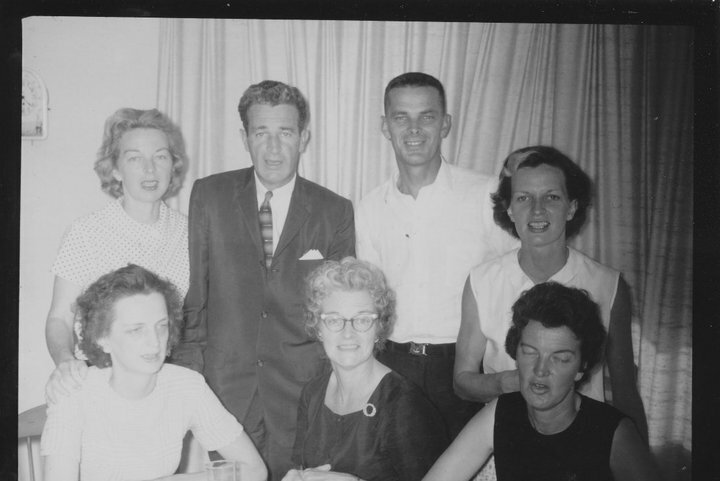 The same family tale from eight different people, and each remembered a detail the others didn't. Each felt differently about the same event. I learned that people could experience the same event, yet perceive it in a different way. In my nuclear family, there were only two sides of a story, mine and my parents. What a revelation to learn that all adults didn't see things the same way! I learned truth could be a personal perception. My Grandmother Rodman dropped out of fourth grade. She was needed at home to raise her five half siblings as her mother slowly died of "consumption." Her stories were distinctly Dickensian. Her older brothers left home at 12 and 14 to get away from their "evil stepfather", who abused all of the children. 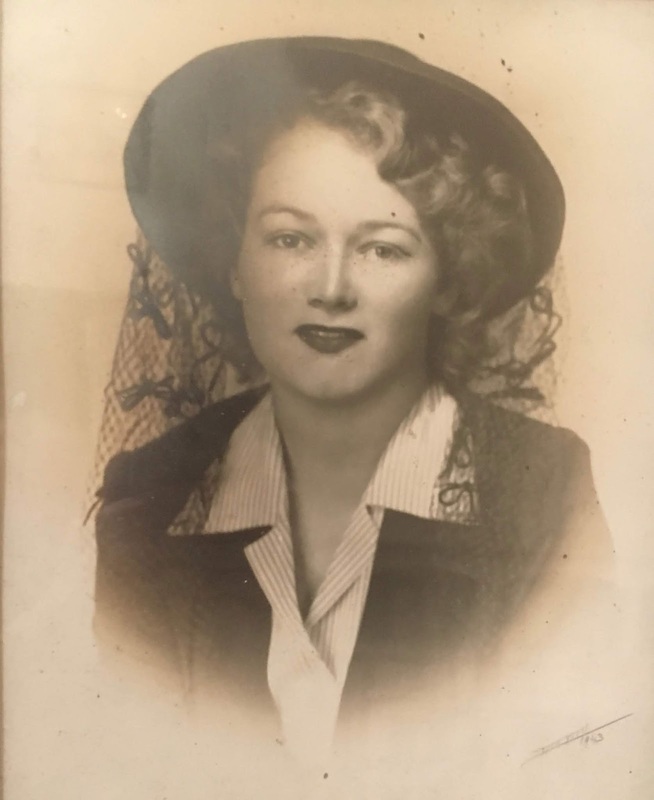 When her mother died, and "evil stepfather" tried to marry my 14-year-old grandmother, she too ran away and became a "hired girl," always with the idea of returning for the "little'uns." As a young mother, she, my grandfather, my dad and his older brother lived through the deadliest tornado in American history. I heard these stories over and over. My grandmother had a keen eye for detail, and knew how to sequence a story, building to the climax. 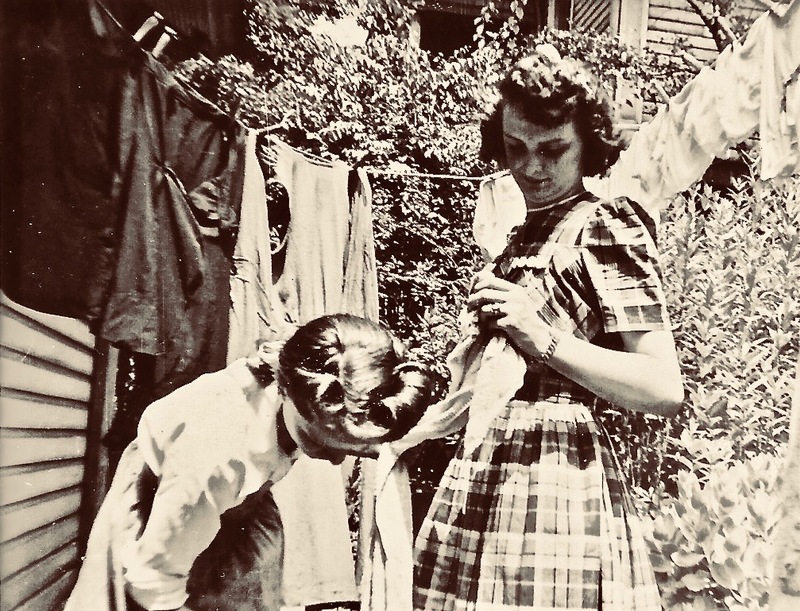 Again, she didn't think her life was anything but ordinary....but in addition to the violence of her childhood, and the gore and horror of "The Storm," her stories contained descriptions of making peanut brittle, being given her dead mother's clothes ("Somebody ought to get some wear out of them.") memorizing poetry for contests at her one room school house. I soaked it all in. 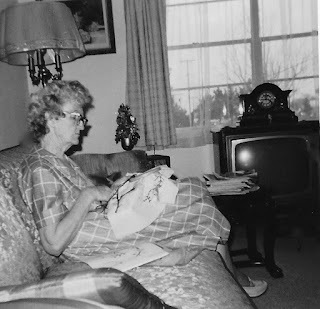 or as she is doing here, embroidering. 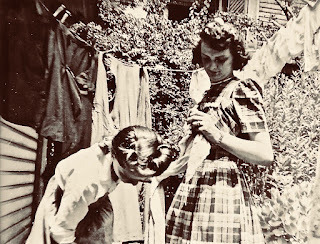 My father-in-law John could tie with my grandmother for The Childhood Most Like a Dickens Novel prize. Losing his train engineer father in a wreck at age four, dying slowly at home from burns from the exploding locomotive boiler. His mother leaving him and his three-year-old sister with maiden aunts, while she went to chiropractic college in St. Louis. 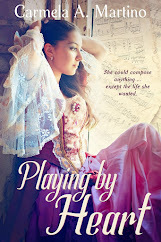 She was a take-charge-lady who wasn't counting on remarriage to save her little family. Although she did remarry, the family bounced from state to state during the Depression, barely getting by. While his childhood was grim, his adult life was nothing but sheer luck. He joined the Navy in the 1930's to pay for college. He did his time, then went to Purdue, only to be recalled in 1940. His base? Pearl Harbor. His ship left for maneuvers Dec 4, 1941, missing the attack on the US fleet. Over the next four years, he survived two ships sunk in torpedo attacks, met and married my mother-in-law, an Australian debutante, and fought in so many naval battles I've lost track. The Battle of Savo Island is the one I remember. 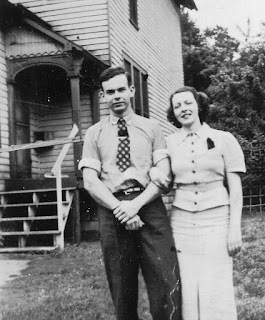 Like my grandmother, my father-in-law John had an incredible memory. He once told me that when he couldn't sleep, he reimagining every night watch on ship--the other sailors, the weather, the enemy vessels. I could (and did) listen to him for hours. He was the only WWII veteran I knew who would talk about being in combat...while sober. John, high school graduation and sister Virginia. "You're a good listener," he'd say. "None of my kids care anything about the war or family history." I couldn't imagine someone not caring about their family's past, but my husband and sister-in-law didn't. I am sad that they cared so little for their father's brave and incredible life. This is my family. They all have(had) their quirks and prejudices and ongoing feuds with other family members. They also had guts and drive to live through hard times, wars and personal sorrow. Lucky for me, they didn't believe in forgetting their pasts, good or bad. They told me, always the eager listener. As a child, I overheard Mom talking about me. "She's a writer," Mom said, in an exasperated voice. "I don't know where she gets it." But I do--from Mom and Dad, Meemaw and Pawpaw. Aunts Agnes, Sarah and Georgia. Uncles Tom, Andy and Jim. Uncle Gee and Aunt Eileen. In-laws John and Babs, and Babs' sister Adele. All my cousins, but especially Sherry, Val, Melissa and Walt. Thank you all. Through you, I've lived other lives and times. You gave me the gift of our families stories. The best gift a writer can have.